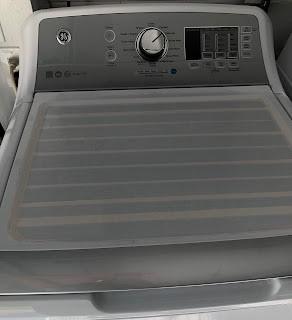 LaundryGoddess.com: My GE Top-Load Washer Review, and an OMG Update on Glass Lid! The washer was delivered without an instruction manual, which I didn’t notice until the delivery guys had left. I had just assumed it was in with the dryer manual - oh well. The washer is easy enough to use without instructions anyway. It’s a nice looking, simple machine, with a lot of room in the tub for sure! The tub is so deep that I think if you are on the short side, you might need a step stool to reach all the way down to the bottom. I like the clear lid too – nice to see what’s going on inside. There are all sorts of combinations of wash settings, temperatures to suit anyone, along with the ability to set “My Cycle” to remember your favorite. There are also optional settings for blood, wine, grass stains, etc, which I have yet to use, since I prefer to handle those things before they get to the washer. This is definitely not the quietest machine around, but since it is in the garage, it is more tolerable. I would not recommend it for interior laundry rooms. The noise is not too bad during the washing, but it has a wicked fast spin cycle that can sound like a helicopter taking off! Because of the spin cycle, I would also not recommend leaving heavy loads unattended. Even though I am careful to evenly distribute the load in the tub, it does tend to become unbalanced, vibrate and sometimes “walk” across the floor on the spin cycle of heavy loads. So in using this model without an agitator, I have noticed a few things. Yes, it is gentler on your clothing, but I sort of feel like the agitator played an important role in moving your clothes around enough to help remove dirt and stains. I have found that if the clothes are not too dirty, the HE and no agitator features are not a problem. However, if you tend to have very dirty laundry, then you will probably want to do smaller loads and add more water. Oh, and about adding more water – this HE model definitely skimps on the water. I always have to use “Deep Fill” and “Deep Rinse” settings to get enough water to cover and properly agitate the clothes enough for a thorough cleaning. Maybe it’s just a mental thing with me, but I like my laundry completely submerged. Again, the clear lid helps to see, without interrupting things. After some trial and error with this machine over the past year, I finally found a happy medium. Overall I’d give it a 7 out of 10. I also purchased the GE 7.4 cu ft Electric Dryer at the same time. It’s a match for the washer – nice and simple. The inside is huge – plenty of room for large comforters and blankets. The panel is easy to use, with 12 drying cycles for a variety of fabric types. It is definitely quiet enough for interior laundry room. Laundry loads dry quickly, usually before the times cycle is completed – much faster than my old dryer. Favorite features - Extended Tumble is great if you tend to forget to remove items right away. I have absolutely no complaints about this dryer in this first year. So...here's the update. 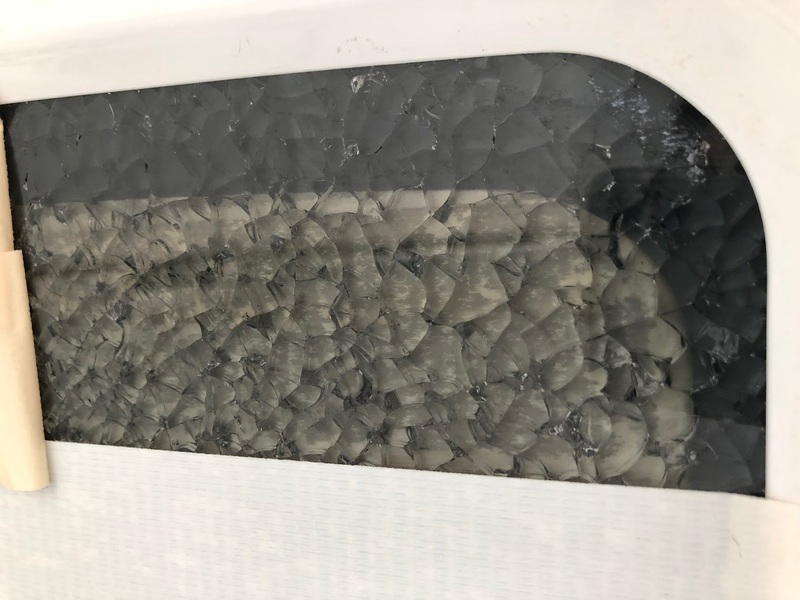 I was installing a shelf above the washer and dryer - everything went fine until I was cleaning up and dropped a small drill bit (seriously it was only 1/8) onto the washer's glass lid. It must have hit 'just right' because it shattered like an iphone! Even though it stayed intact, it was sharp to the touch in spots and continued to make crackling noises for about an hour. 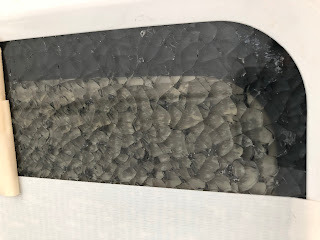 Luckily, there was a roll of white duct tape nearby which I used to cover the inside and outside of the lid to prevent injury and from bits of glass getting into the washer drum, should it fall inward. I didn't take a picture before taping, so I peeled back two strips for this picture. Knowing this wasn't covered by the extended warranty, I braced myself for a pricey repair bill. It turns out that the part is $243.50, not including shipping and of course that would be installing it myself (no big deal). Meanwhile, I still had laundry to do, so making sure the tape was on there good, I gave it a shot. No problems - score one for duct tape. In hindsight, glass lids on washing machines might not be the best idea. If you have one, be sure to have duct tape handy!